My wife loves this recipe and finds reasons to make it often. It’s helped by the fact that we had a giant harvest of squash this year, so we had to find lots of ways to use it. 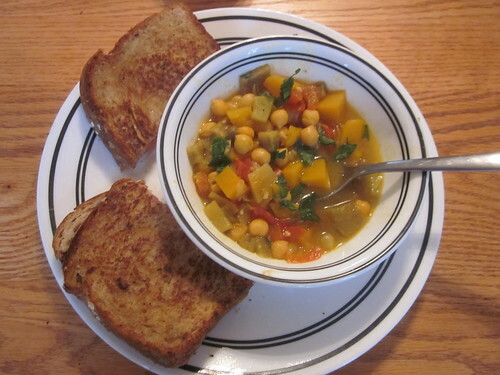 I like curried soups and stews, so that definitely contributed to my desire to share this one with you. Most of the cost here is going to be the vegetables, so the more of these you have access to outside of the grocery store, the less expensive this recipe will be. The best thing to do in advance is to chop up all of the vegetables and store them in bowls in your refrigerator. You can store the bell pepper and onion together, and you can store the eggplant and squash together, too. Preparing the meal is really simple. Just put the oil in a large saucepan over medium heat until it’s shimmering. 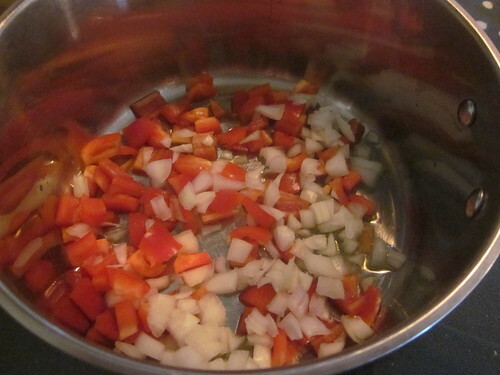 Then, add the bell pepper and onion and stir for five minutes. It’ll smell really good at this point! Next, add the garlic, curry powder, and a dash of salt and pepper and stir for a minute more, then add the remaining ingredients. Wait until the liquid is at a low boil, then reduce heat until the liquid is barely simmering. Let it sit for twenty five minutes, then serve. We accompanied it with a simple sandwich. 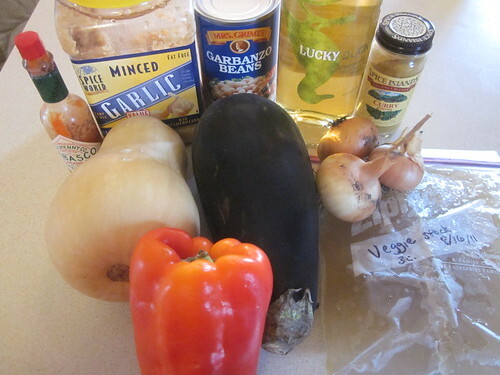 You can make all kinds of vegetable substitutions in this meal and still have a great soup. 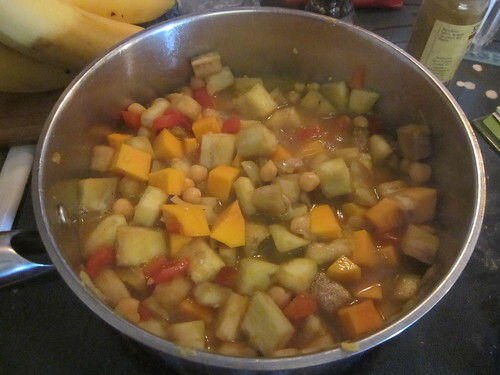 You can use any kind of bell pepper, replace the chickpeas with other kinds of beans, use pumpkin instead of the squash, and so on. As always, use what you’ve got on hand or have inexpensive access to.